Welcome to Alloy Plumbing Services. We offer a 24 hour service which is both reliable and efficient. Our aim is to always have a plumber to you within one hour of your call. You will not be charged a call out fee and our rates are fixed regardless of week days or weekends. We offer a 10% OAP discount and a 12 month written guarantee for all of our services. 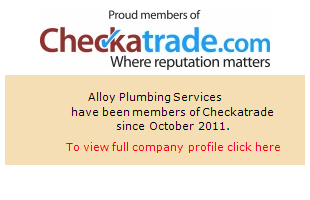 We have currently achieved over 500 excellent reviews on Checkatrade.com and welcome more to come. For more on services we offer CLICK HERE.